You’ve been building up quite a robust set of tools. 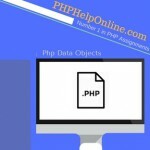 You have PHP scripts to receive requests from your HTML forms. 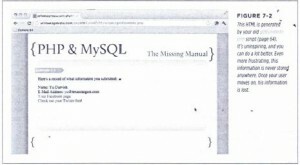 You have MySQL to store information from your users. You have regular expressions to massage information into just the formats you need, and some basic flow controls in PHP like if and for to let you build scripts that make decisions based on what information your users give you. But, at the end of the day, your goal in learning PHP and MySQL was probably to make dynamic and interesting web applications. Unfortunately, you’ve not done much of that yet. You do have a few interesting forms, but even those are simple: take in some information; print it back out; accept a SQL query (and do that quite imperfectly). So, where are the web applications? Heck, where are the pages that are built dynamically using your user’s information? Thankfully, you have everything you need to start building these kinds of web pages. You can get information from your users, store it in a database, and even do some basic data manipulation., All you need to do now is put it all together and create the basic web pages that most users expect: a place to enter their information, a place to look at their information, and in most cases, a place to look at all the related user’s information. you built a form in which users can enter their basic social media profile: a Twitter handle a Facebook URL, and some basic contact information. As shown in Figure 7-1, it’s a perfectly good form: simple and easy to use. There’s really no reason to change this form. However, the script that accepts its information is pretty lame. 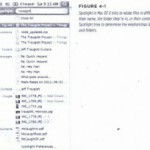 It does nothing more than manipulate some text and then send that text back (see Figure 7-2). It doesn’t even save the form’s information for later use. 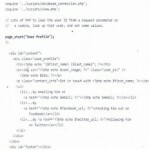 That’s where the work is: making the script do with the user’s information. Building web applications is a lot like working a tricky maze: Sometimes the hardest part is figuring out where to start. 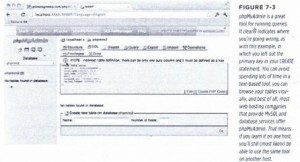 Usually a web form needs a script to which it can submit data. That script needs a table into which it can insert and store information. But, where’s the table? 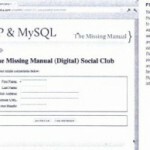 In a MySQL database, you need to create or set up tables for web access. Of course, the table itself needs structure. That’s the way almost every form of every application goes: What starts out as a page that users see often ends up at a back-end structure that’s invisible to everyone but you, the programmer. Each of these items are individual components that when combined describe a single “entity”-a user. What you need, therefore, is a table to store users, and for each user, you need to store a first name, last name, e-mail address, a Facebook URL, and a Twitter handle. You might remember this SQL from ,but that was ages ago, when you had but a fragile understanding of databases. 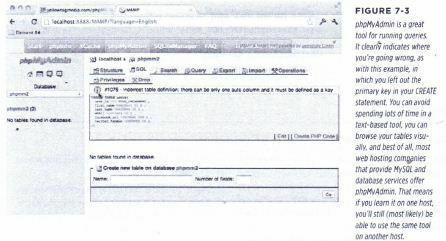 Now, you know exactly what is going to be dropped into this table: information from the web form that you already have. 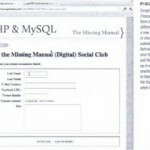 Take a look at the first column created for this table: the user _id field. What exactly is that? Well. think about the most common thing you’ll do with databases. Is it ereating new entries in the table? Probably not. Honestly, if you think about how often you create a user ID or profile on the Web versus the number of times you log in to a site, you log in many, many more times . 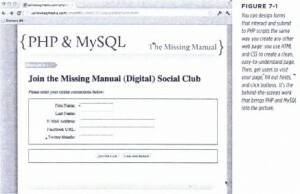 Databases are no different in that they need something for which to look. 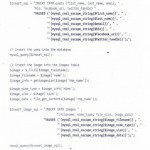 Moreover, databases work best when they can identify every individual row in a table by a unique piece of information. Putting it more accurately still, databases function better with numbers than with text. The absolute preferred type of unique identifier-or ID-for a row in a table is a unique number. 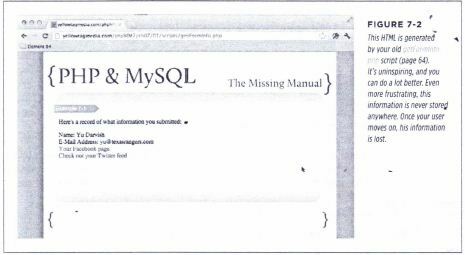 There’s a bit of a problem lurking in the SQL bushes here, though. If the point of the user ~id field is to provide a unique identifier for each user, whose job is it to keep up with that unique ID? How do all the scripts (and there will be more than one or two before you’re done with any large web application) ensure that no two users are entered into the users table with the same user _id? Do you need yet another table just to keep up with the current count of users? This isn’t a trivial problem, because if you lose the ability to uniquely identify a user, things can go south from there quickly. On the other hand, nobody wants to spend hours writing number generators for every table or every web application. The solution is not in your code, but in your database. Most databases, MySQL included, give you the ability to use an attribute called AUTO_INCREMENT. You specify this on a field in a table, and every time you add a row to that table, the field automatically creates a new number, incremented from the last row that was added to the table. For example, if one script adds a new user and MySQL sets the user _id to 1029, and another script later adds a new user, MySQL increments the previous number and assigns 1030 as the ID of the new user. In addition to setting user _id to increment automatically you’ve actually done something else subtly in MySQL: you’ve basically defined user _id as the Dr in the users table. 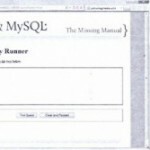 The primary key is a database term for that special, unique value assigned to a particular rDW in a table. Basically an indexed field is like having a highly organized set of values. An unindexed field can still be searched, but in that case your database has to go through each” value, one by one, until it finds the exact value for which you’re searching. It’s the difference between looking for a book in a well-organized library and looking for one in your great-great-grandfather’s deserted attic. If you were to run this query, MySQL would give you a bit of a weird error in the php My Admin console, as illustrated in; Figure 7-3.
to create this table for real. Remember that the purpose of a field like user _id is to facilitate eaioY searching. Adding AUTO_INCREMENT (and setting the field as a primary key) helps in that, but there’s something subtle that also happens behind the scenes when you create an AUTO_INCREMENT column. 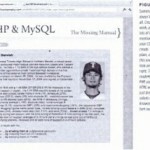 You are also saying, “No matter what, this column will have a value.” That’s because MySQL is filling in that value. Of course, could just decide to have your PHP scripts and web pages deal with requiring this information. But is that really safe? What if someone else forgets to add validation on a web page? What if you forget, writing code on a coffee-high one day, typing away at 2 a.m.? It’s never a good idea to not validate when you con validate. However, don’t get too trigger-happy with NOTNULL, thinking that it’s just safer to use it frequently and grab more data rather than less. Users can become upset if they’re forced to fill out 28 fields just to use your site. Even mega-sites like Facebook and Twitter require only minimal information: usually a name, email, user name, and password. Everything else can be added later. Like AUTO_INCREMENT, this change is quick, easy, and goes a long way toward protecting the integrity of your information (or, to be more accurate, your user’s information). You should have a useful SQL statement, so go ahead and create your,table. 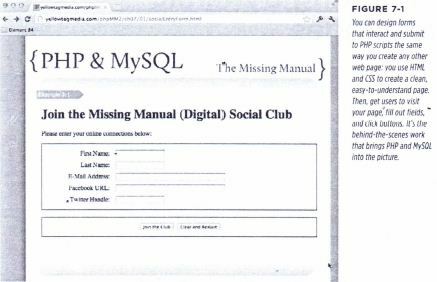 Log in to MySQL by using your command-line tool, the web form you built earlier, or another web tool like php My Admin, and create the table. You’re about to need it. If you’re using a tool like php My Admin, you can now view your created table, It should look something like Figure 7-4.